Steiner's Protect-O-Screen® HD™ is the most rugged and flexible welding screen in the industry. The HD frame is constructed with heavy duty 1" square 18-gauge steel and 1-1/8" square corners and legs for outstanding durability and stability. The Quick-Snap™ connection allows screen frames to be assembled in minutes and without the use of any tools. Protect workers, material, and equipment from hazards of welding sparks, spatter, and UV flash. 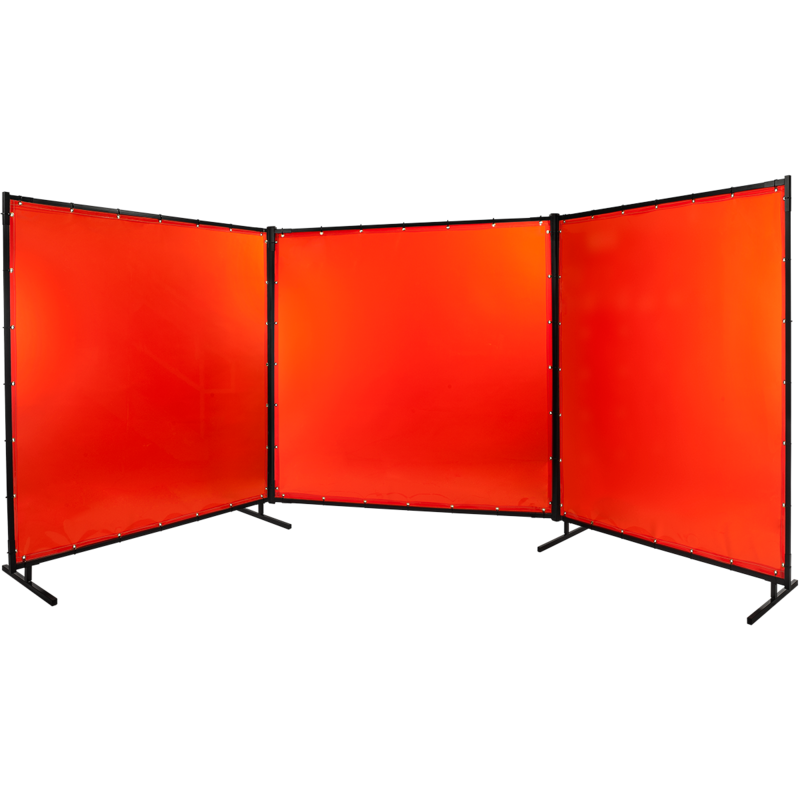 The patented modular framing system offers more flexibility than any other screen on the market and provides the widest range of multi-panel configurations. The unique modular design allows addition, removal, replacement, and rearrangement of individual panels to adapt to new requirements in just minutes. Use individual panels or join together to form multi-panel enclosures or in-line dividers. Sturdy square tube frame is designed to eliminate slipping and twisting that occur with round tube frames. WARNING: Tinted transparent vinyl screens provide protection for casual passerby only and are not intended as a substitute for normal eye protection for close or long-term viewing. The user must wear protective eyewear suitable for the application. Clear transparent vinyl does not reduce harmful UV light from welding operations. The Protect-O-Screen® HD™ system offers complete flexibility to build any size or shape enclosure you need with in wide variety of tinted transparent and non-transparent curtain materials, colors and sizes. Use 2-, 3- or 4-panel Connect-O-Screen™ connectors to form multi-side enclosures or in-line dividers. Steiner’s unique Connect-O-Screen™ connection system joins single Protect-O-Screen® HD™ using 2-, 3- or 4-panel connectors to form multi-sided enclosures, in-line dividers, or safely enclose on four sides. Connect-O-Screen™ is easily inserted into the frame top and bottom corners of adjoining frames. The unique modular design allows for the addition, removal, replacement or rearrangement of individual panels to adapt to new requirements in just minutes. Connects 2 single Protect-O-Screen ® HD™ panels to form a 2-, 3-, or 4-sided enclosure. Connects 3 single Protect-O-Screen ® HD™ panels to form a common hub to divide welding stations. Connects 4 single Protect-O-Screen ® HD™ panels together from a common hub to create station dividers or enclosures. Optional caster wheels allow for quick and safe mobility. Screens are available in a wide variety of transparencies and colors. The images below illustrate the relative transparency. The actual view/image/imagery depends on the type of welding, distance from the welding screen, and surrounding light type (indoor or natural) and intensity. These illustrations are to be used as general reference for comparison only.